Found 1011 Matching Results. View archived News Here. “The One Health concept stresses the ecological relationships between human, animal, and environmental health. Much of the One Health literature to date has examined the transfer of pathogens from animals (e.g., emerging zoonoses) and the environment to humans. The recent rapid development of technology to perform high throughput DNA sequencing has expanded this view to include the study of entire microbial communities. Applying the One Health approach to the microbiome allows for consideration of both pathogenic and non-pathogenic microbial transfer between humans, animals, and the environment. We review recent research studies of such transmission, the molecular and statistical methods being used, and the implications of such microbiome relationships for human health. Our review identified evidence that the environmental microbiome as well as the microbiome of animals in close contact can affect both the human microbiome and human health outcomes. Such microbiome transfer can take place in the household as well as the workplace setting. Urbanization of built environments leads to changes in the environmental microbiome which could be a factor in human health. While affected by environmental exposures, the human microbiome also can modulate the response to environmental factors through effects on metabolic and immune function. Better understanding of these microbiome interactions between humans, animals, and the shared environment will require continued development of improved statistical and ecological modeling approaches. Such enhanced understanding could lead to innovative interventions to prevent and manage a variety of human health and disease states. ... "
The One Health Platform organizes its One Health congresses on a biennial basis. These meetings are the world’s premier conferences for the global One Health community as they bring together One Health advocates for four days of inspiring lectures, debates, workshops and symposia. In evidence of the ground-breaking and captivating nature of our congresses, we have assembled a selection of lectures on different One Health topics for you. 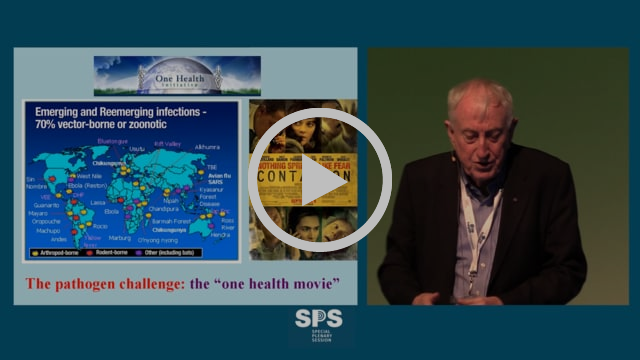 These contributions have been video-recorded during the recent 5th International One Health Congress in Saskatoon. We are pleased to share these free lectures with you in a weekly newsletter. 18 single episodes in 2018. Please feel free to share this free lecture with anyone you think may be interested. Or send his/her contact details to the One Health Platform’s management at d.degraef@onehealthplatform.com. We’ll be happy to add him/her to our contact list. ”A novel gene therapy proven to halt vision loss in dogs is believed to have One Health potential. The scientists who developed the therapy, which treats a condition that causes blindness called autosomal dominant retinitis pigmentosa (adRP), are hopeful that their strategy may one day be used to delay or halt vision loss in people with the same disease. Retinitis pigmentosa, the most common inherited form of blindness, affects an estimate 60,000 to 100,000 people in the United States. "Dawn Sievert, associate director of antimicrobial resistance, Division of Foodborne, Waterborne and Environmental diseases at the Centers for Disease Control and Prevention, gave a little insight on how the CDC views microbial resistance—their perspective, interactions and collaboration. The One Health Initiative is how the CDC is dealing with antimicrobial resistance." SciTech Europa explores how the One Health Initiative has pioneered a cross-species approach to healthcare. There is compelling evidence that our planet is in peril. Human, wildlife and domesticated animal populations face growing health risks from such things as climate change, population growth, zoonotic pandemics and increased urbanization. These health risks are impacted by local and global environmental factors. One Health is a collaborative effort of multiple disciplines working locally, nationally, and globally to attain sustainable optimal health and well-being for humans and animals. It is the intersection and inextricable link between human health and animal health, and the connections between health and natural and man-made environments. For many individuals, implementing One Health concepts and their related socioeconomic impacts is a cultural, behavioral and paradigm shift. Many One Health concepts are driven by socioeconomic issues which include, but are not limited to: population growth; nutritional, agricultural, and trade practices; globalization; shift in land use; accelerated urbanization; deforestation; encroachment on wildlife; and climate change. *Note: Dr. Chaddock is a longstanding extraordinary One Health expert, leader and Supporter/Advocate http://www.onehealthinitiative.com/supporters.php.